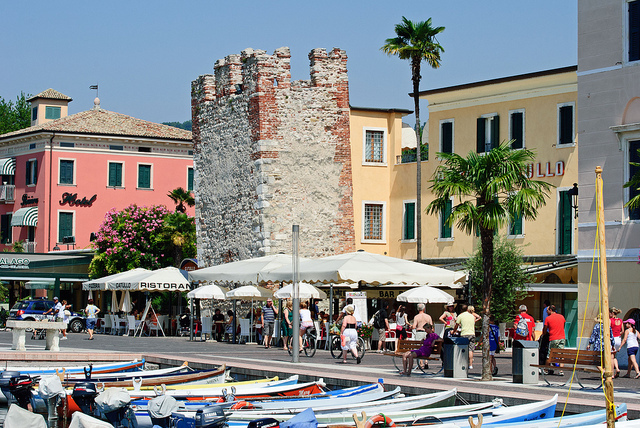 Bardolino is a municipality northwest of Verona in the Veneto region and located on the eastern shore of Lake Garda. Starting yesterday, the town is hosting a 5 day festival dedicated to grapes and wine. The festival is in its 86th year, is well organized and easy to find. Stands serving food are open from 11:00 AM – 1:00 PM each week day and 10:00 AM – 1:00 PM on Saturday and Sunday. With stands serving various pastas, meats and cakes there is something for everyone’s tastes. Musical acts performing each afternoon and evening range from folk music to country. There are guided tours and historical parades on the weekend and a fireworks display at 11:00 PM on Sunday October 4th. While in town for the festival check out the old city walls dating to the 12th century, the medieval crypt in the Church of San Severo and the Museo Sisan which is dedicated to bird hunting and fishing of the Lake Garda region.